Much more discreet and more easily denied than also-denied petrodollar recycling operated by the US and Saudi Arabia, the EU’s “gaseuro” and “petroeuro” currency recycling operated with Russia – especially by Germany, Italy and France and other EU states, is starkly different to the “petrodollar system” because it is an economic win-win. Because of this, the EU after ritual blethering and cries of alarm will avoid operating economic, trade, monetary or other sanctions against Russia. Using the monetary and economic leverage of gaseuro recycling, the EU’s national treasuries and financial institutions of the ECB and BIS, as well as private banks, can only hope to finance the massive black hole of Ukrainian national finances. Conversely, any sanctions operated against Putin’s Russia will backfire immediately as Russia cuts all gas supplies to, and passing through, the Ukraine triggering an instant continental economic crisis, backed up by Putin’s additional ability to suspend or limit oil shipments to Europe. The simplest way to understand why the gaseuro and petroeuro recycling system is a win-win is that the EU, led by Germany runs a major trade surplus with Russia. Buying Russian gas and oil, paid for with euros, enables Russia to buy European goods and services, and create credit for further buying. When or if the EU was foolish enough to run sanctions against Russia, this major economic support to the continent’s basically weak and stagnant economy would collapse. It would be lose-lose. World reserves of natural gas are massively larger than oil reserves, although the magic adjectives “conventional and unconventional” heavily change any figure you care to use. One handy figure is that world conventional associated (with oil) gas reserves plus stranded (not associated with oil) gas reserves are roughly equivalent to 100 years of present world total gas consumption. Conventional oil reserves are enough to cover about 40 years of world total oil consumption. Making things a lot more complicated, with little-appreciated but major coming impacts, which include impacts on world money systems and the shadowy but real “petrodollar system”, gas can substitute a lot of oil. It can be converted to synthetic light oil albeit at large energy loss, it can substitute oil for petrochemicals, it can replace oil for road, rail and marine transport. For heating, both industrial and residential, gas is the best and easiest energy fuel. Oil is substitutable. Outside of Europe, all major regions and economies are raising their gas demand faster than their oil demand. For diehard Global Warming believers, gas is also “low carbon” meaning lower CO2 emissions per unit energy used, and non-carbon pollutants in gas are almost zero. This can be compared with typical heavy crudes such as Saudi Heavy of 27.5 degrees API weight, containing 2.92% sulphur and a string of metals starting with iron, vanadium and nickel, and able to include zinc, manganese, mercury, chromium and others. Heavy oils sometimes even include thorium and uranium. Heavy oils can only be heavily polluting, meaning heavy oil spills are always an environmental disaster and extracting them is always dirty. As we know, the extraction and refining of heavy oils and oil sands generates as much as three times the total CO2 emissions compared to conventional oil, simply due to the energy needed to extract and then refine oils which in extreme cases can have a weight of 10 degrees API, that is bitumin or asphalt. Key examples of heavy oil production as in Venezuela, Canada, Saudi Arabia, Kuwait and Iran are rarely able to extract more than 5%-25% of the crude oil in place. The so-called “upgrading” of these ultra-heavy crudes can only pollute and can only cost money. This locks-in the high price of oil because the extraction and refining process is so resource-intensive. Put another way, when oil prices decline the economic rationale for heavy oils disappears. For as long as oil demand was believed to be hard or impossible to substitute and no energy policy action was taken to reduce or substitute its consumption, high oil prices locked-in the upstream production and refining side. This enabled continually-increasing production, and the so-called “producers’ rent”, that is overpriced oil, could operate. When it did not operate – notably the period of roughly 1983-1999 with low or very low oil prices (and of course the entire postwar period to 1973 and the famous Arab Oil Shock) – the petrodollar system had a role to play. Its fundamentals included the notion that world oil demand could only increase, oil was scarce and controlled by OPEC and only in exceptional conditions – as in 1983-1999 for geopolitical reasons (including the Iran-Iraq war) – could oil prices be pushed down and kept low. Taking world gas prices of today, which are massively distorted by region and nearly always underpriced relative to oil, current European gas prices around $11 per million BTU are equivalent to oil at about $63 per barrel. As we know, due to the USA’s stampede into shale gas, prices in the US (although rising) are less than one-half European gas prices, while Asian gas prices are the highest at close to the oil price (about $16 per million BTU). In both cases this especially concerns Russia, which has many times tried to create a “Gas Opec” group and organization of major gas producers and exporters, without success. Russia is also the biggest “Nopec” oil producer and exporter. It is a key player in the undeclared and “off the radar screen” petro-euro recycling system, especially concerning Russia-Germany financial and monetary relations, utilising euro surpluses and deficits, linked with financial entities including the ECB and BIS. The financing of government deficits across Europe draws, in part, on this petroeuro and gaseuro recycling system operated near-exclusively with Russia. Gas was always the “poor cousin of oil”, for many years priced at below $2 per million BTU (equivalent to oil at $11.60 per barrel), and pre-1973 at prices around 40 US cents/MBTU. It was rarely transported and sold across frontiers, and accounted for less than 12.5% of world total energy consumption (23% today). Gas never featured in the US-initiated petrodollar system but it was a key player in the Europe-Russia gaseuro recycling and financing operation, from the start. Always thought of by its US and Saudi inventors as a win-win, the “petrodollar system” has many downsides and for the global economy it is only lose-lose, because since at latest 2005, it operates to maintain oil at artificially high prices and enables (or forces) the US to run huge trade deficits. Just as important, the system started as a secret political initiative and will end political, but possibly public. Its economic, financial and monetary roles were always placed in the back seat, and only one aspect was treated as paramount. Favouring US-Saudi economic relations and bolstering the US dollar. One key factor turning a theoretical geopolitical win-win into an economic, financial and monetary lose-lose, certainly for the USA, stems from US debt and “dollar hegemony”, both of them pushed only one way – further – by the petrodollar system. Put another way, the US of today can only operate its debt financing-money printing binge for as long as oil prices stay high, or very high. The petrodollar system is above all political and concerns the US and Saudi Arabia. Due to current-ruling Saudi potentates, notably the very recent “Intelligence supremo” Prince Bandar bin Sultan claiming there should be Saudi rule over US decisions – notably on Syrian bombing – the threat of Saudi Arabia “abandoning the petrodollar” has been given a whorl in the media. When or if Saudi oil exports were increasingly billed and settled in currencies other than the USD, the present semi-monopoly of the dollar for global oil trade would disintegrate. 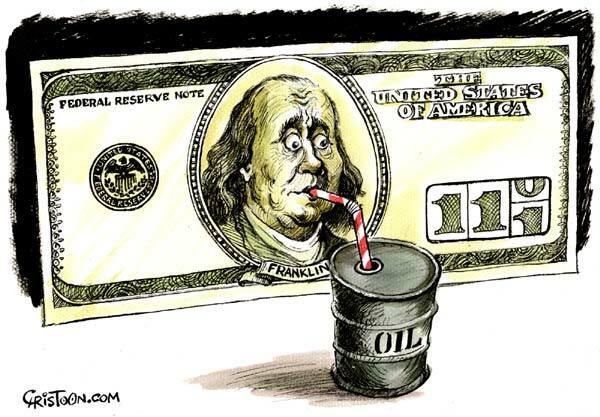 The pat-analysis is that when or if Saudi Arabia “abandons the dollar” for oil sales, the dollar will sink out of sight. The exact opposite is more likely – a strengthening of the USD’s world value after a ritual and probably impressive period of “trial by market”. To be sure, market logic – we mean engineered panic – would take some time to adjust to the real world, as ever, but the main reason the dollar would strengthen would be the USA’s need to print and issue far less and far fewer “chaff dollars”. The exact inversion of trade relation between the US and KSA on one hand, and the EU and Russia on the other explains why petrodollar recycling is on its way out, but the gaseuro recycling operation will be a key player deciding what happens in the geopolitical shakeout of eastern Europe presently under way, starting with the carve-up of the Ukraine. The US, for as long as it remained an importer of oil and considered to have “constantly increasing oil import dependence”, could only run a trade deficit with KSA and other Opec suppliers. The European Union, and especially Germany run a major trade surplus with Russia. Supplying petroeuros and gaseuros to Russia enables it to buy EU products. For decades, Washington has bowed and cowed, and gone to extraordinary lengths to mollycoddle the Saudis, despite the huge Saudi exposure – due to nearly all its money reserves of about $700 billion being in dollars – to any theoretical crash of the USD’s value. Putin’s Russia is less exposed to this form of blackmail. Russia can import more from Europe if the euro depreciates, and use gas prices and oil prices to tilt the playing field towards a weaker but not crippled euro. Europe in fact has a present win-win with Russia, due to the artificially high value of the euro plus gaseuro recycling. The EU is unlikely to throw this win-win away to “save Euromaidan hopes and expectations”. In another vast difference with US-Saudi petrodollar recycling, US debt would have in no way grown so fast, to such extremes, nor would the US trade deficit have ballooned, if the “petrodollar system” had not existed. Petrodollar recycling was designed and operated to print money – long before Ben Bernanke, Janet Yellen and QE. US gains throughout all the phases or formats of “the system” which started in 1972 under Nixon and Kissinger were always more apparent than real – but the US political elite feeds off appearances. One of its key basic defects. Without the prop of petrodollar recycling and its leverage, operated by the US Federal Reserve banking system and the leading US money market banks, for decades, it would be unlikely that the US could run its present fantastic annual trade deficits. The US economy would have to “re-localize”, or “de-offshore”. Europe, although deindustrializing, has avoided this – as shown by Germany remaining an industrial power, proud of it, and rich because of it. 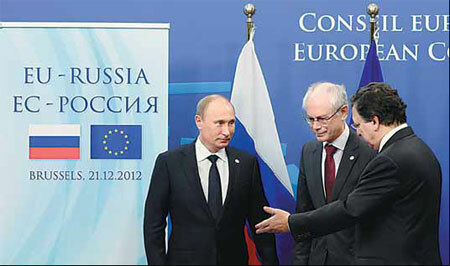 PUTIN’S COUP: In reality, the EU has no leverage over Russia at this time. Europe has no leverage over Putin’s Russia. Europe also gains from the gaseuro recycling system. After the ritual cries of alarm, Europe can build on the gaseuro recycling system to lever part of the heavy financial aid that must go to Ukraine – simply to prevent its total economic collapse. For the US and inevitably, the end of petrodollars and their recycling will mean an end to the era of cheap imports and super low interest rates, but will also reset the global economy – not at all to the disadvantage of the USA. China, now the world’s No 1 oil importer, will be obliged to move fast to replace dollars for its oil trade. This will mean the RMB appreciates, which is what China doesn’t want, but has to accept. One thing is certain, any attempts by KSA to sabotage the US dollar will not be germane to China – which holds about $1.25 trillion of US Treasury bonds. Only a quick glance at Europe’s gas and oil supply, transport, refining and distribution system is needed to show that the EU has massive dependence on Russian hydrocarbons – and profits from it, but denies this. As Putin’s Kremlin, and Russian ministries including the Finance ministry are well aware, EU dependence on Russian hydrocarbons has a direct counterparty in Russian dependence on European industry, services and trade – and the euro. Conversely the real economic interdependence and counterparties between the US and Saudi Arabia are tiny and transient. The US can terminate petrodollar recycling tomorrow. After the ritual gyrations of financial markets for a ritual period, it will suffer no enduring economic loss. When or if the EU tried to terminate the gaseuro and petroeuro recycling system with Russia, there would be massive economic loss in Europe. The Ukrainian crisis, probably sooner rather than later, will bring this energy-economic and monetary dependence, and interdependence with Russia into full view at the top of the agenda. Both the EU and Russia have every reason to cooperate in preventing the Ukrainian crisis from ruining a system that works.